The Church of St Mary of the Salutation ChurchThe church of St Mary of the Salutation is set on a hill overlooking the town, which is the gateway to mid-Wales. The church was built in 1250 as part of the Norman building of the town, but its tower was built for defence against the Welsh on this frontier land. Burnt down several times by the English and the Welsh, it was later rebuilt on three separate occasions. Comprising a medieval tower and chancel, late 16th century nave, 18th century aisles, it was rebuilt by Street in 1870. It contains a wealth of Victorian stained glass, historic monuments, a spacious interior, and one of the five major historic organs in north Wales. It has a peal of eight bells and a still-working early Victorian cage clock. We are proud of our church and wish to share our interest and pride with others and warmly welcome you to visit this historic church which has been a place of worship for over 750 years. We are in the diocese of St Asaph and part of the Church in Wales. 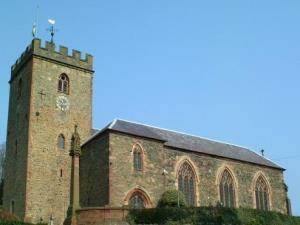 St Mary's is close to the centre of Welshpool.